Jul 20 wildlife safari, grand teton and yellowstone national parks. back in may, we flew to jackson hole, wyoming for a three day safari with jackson hole wildlife safaris. we spent most of the safari in yellowstone, but started and ended in grand teton national park since jackson hole airport is actually inside the park! if you have the opportunity to fly there and land around sunset, i highly recommend it - landing among the tetons during golden hour was absolutely breathtaking. 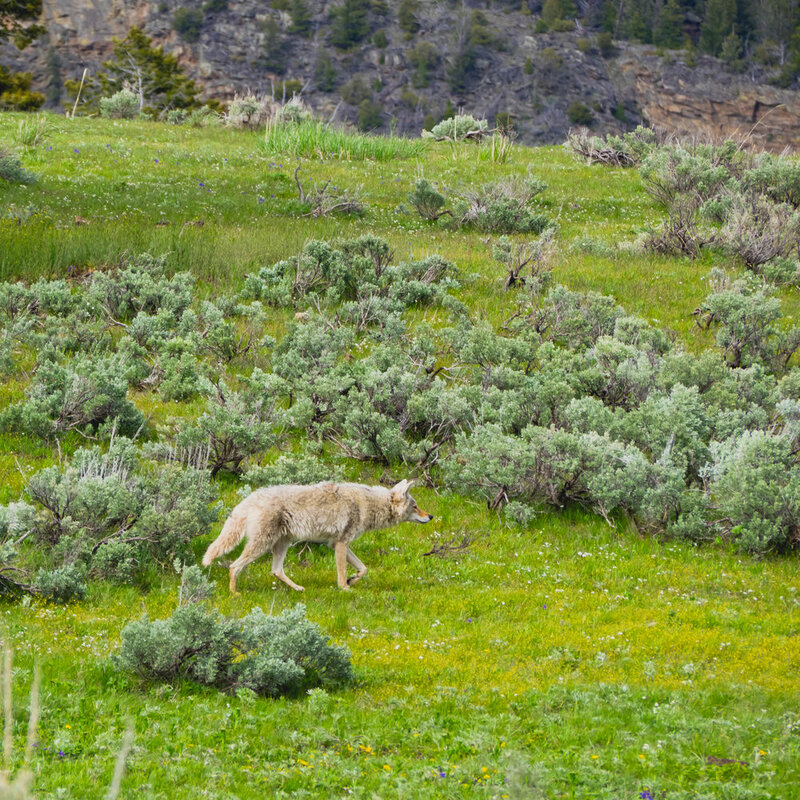 coyote in front of the grand tetons. while both parks are very driveable, and we totally could have driven past the same spots as we did on the tour, but we would not have seen anywhere near as much wildlife! the safari included lodging at the grizzly lodge up in silver gate, montana, just outside the northeast entrance of yellowstone. it was a beautiful spot and they had a fire pit going every night. roosevelt arch, original yellowstone national park gate. at the north entrance of yellowstone, is the cute little town of gardiner, montana where the original park entrance still stands. we saw SO. MUCH. wildlife in yellowstone national park. we saw coyote, black bears, fox, pronghorns, elk, big horn sheep, marmots, moose and wolves! it was spring time so there were also baby animals everywhere! we actually saw this mama black bear and her two cubs twice. the first time, they were napping at the base of a tree and you could only see some snoozing, fuzzy lumps. the next day however, they were grazing in a small field right by the road, and we even got to watch the cubs being playful. so, so adorable. one of the most amazing things we saw was a baby elk, it looked like bambi! white spots and all. we knew it had just been born because it was laying down and then could barely stand or walk, but as we watched it for the next half hour or so, it got enough strength and coordination that it was practically galloping around! we also got to see a wolf den and wolf puppies! but it was from so far away that there was no way to get a good picture of it - but that's okay, if were were close enough to get a picture, we'd probably be dead. of course, you can't go to yellowstone and not check out the abundance of geothermal features like old faithful geyser, the grand prismatic spring and artist paint pots. driving past giant basalt columns. 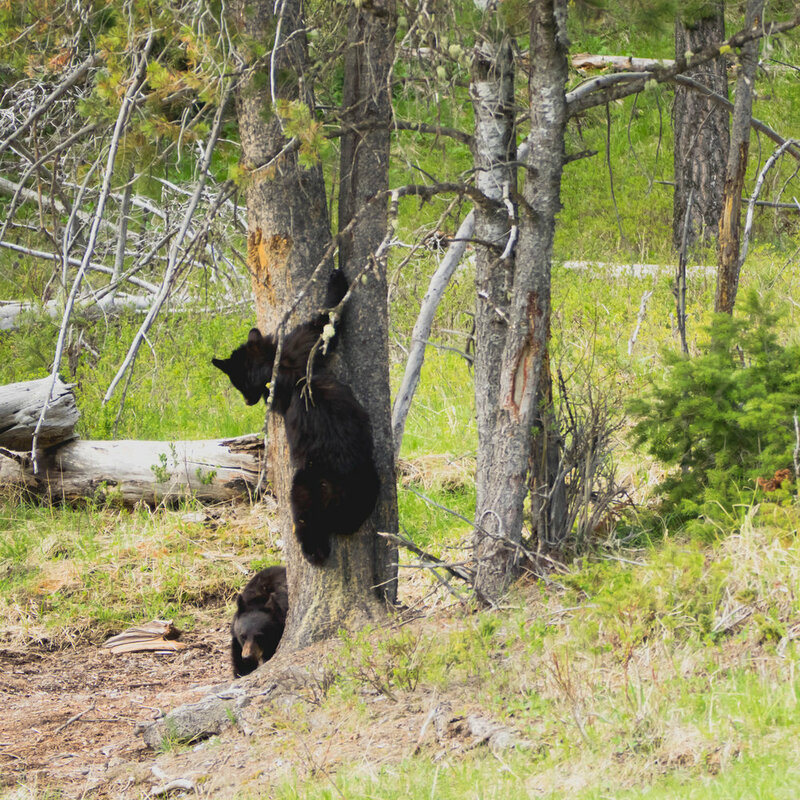 as we were leaving yellowstone, the one animal we had really wanted to see but hadn't were grizzly bears. by pure luck, we drove past a spot with a ton of people stopped along the side of the road (a sure sign of a bear sighting). we managed to jump out and see a mama grizzly and her two cubs walking across a start white geyser basin for less than a minute before they disappeared into the trees. what an amazing sight! mama grizzly and two cubs. this trip was so, so awe-inspiring and we really can't recommend the folks over at jackson hole wildlife safaris enough. our guide was so knowledgeable, helpful and professional. we had the absolute best experience, and are already planning on trying to go back to see it in different seasons. Sep 22 solar eclipse & great smoky mountains national park. Oct 14 olympic national park, wa.